This year’s Debacle Festival is looking to be an amazing lineup, spanning four days and three venues—Sam has outdone himself! Also, take note: two of our favorite bands are on board this year, both making their debut Seattle performances—Portland-based Operative and Golden Retriever! Put this on your calendars and we’ll see you mid-August. 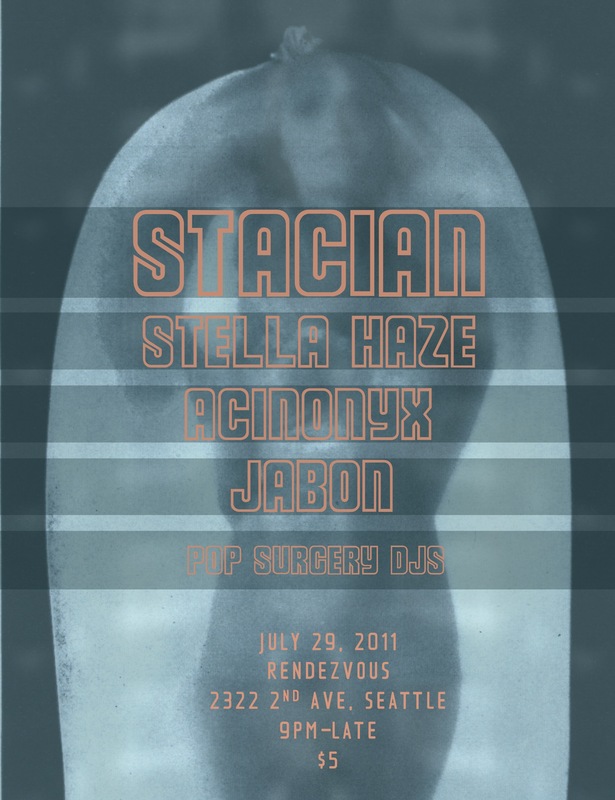 Upcoming Seattle show featuring Milwaukee-based synth popper Stacian and other locals, including Gift Tapes’ Stella Haze, Acinonyx, and Jabon. The night is curated by local Medical Records’ Pop Surgery Synth (see last week’s Stranger article). Still haven’t met the guy behind this label, but I’ll be sure to say what’s up that night— seems like he’s on his game, especially considering his efforts in trying to re-release Novels for the Moon by Axxess! I’ve checked out some of the jams by each of the artists and it’s looking to be an excellent night, so be sure to put this on your calendar. Summer is coming, and to celebrate we’re planning a ripping northwest 3-show mini tour— June 22nd in Portland, June 23rd in Seattle, and June 24th in Vancouver BC. 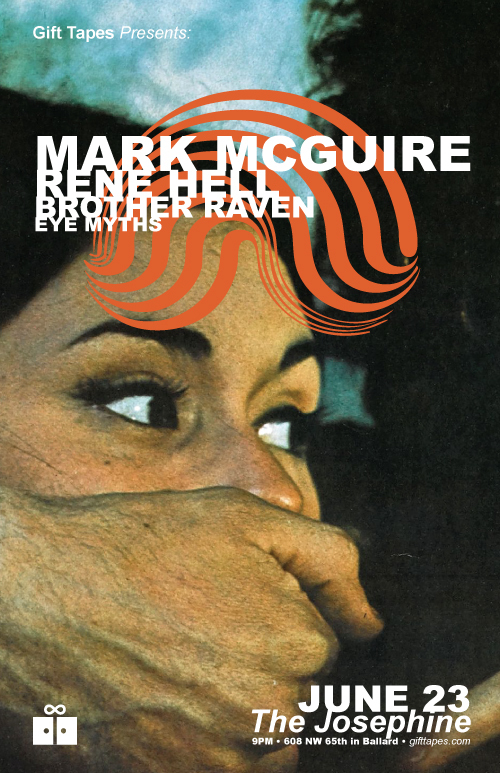 Join us for the epic guitar jams of Emeralds guitarist Mark McGuire, the kosmische music of Rene Hell and Brother Raven, and the abstract machine music of Eye Myths. And for those of you in Portland, it’s gonna be an extra special show at the historic Hollywood Theater, with Charles Berlitz joining the bill (Spencer Clark of Skaters fame), visuals by the artists, and video works by Brenna Murphy! 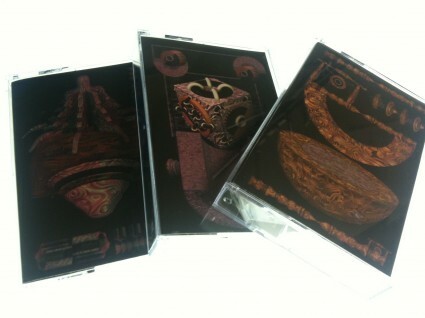 You may have a little harder time wrapping your ears around Matt Carlson’s offering for the newest Gift Tape batch. It is a far, far gone piece of electronic experimentation. You’ll notice that The Wire pretty much follows suit. For me, the weirder the record, the better… and the more I want to listen to it. As a listener, I’m attracted to work that is challenging and hard to figure out—this is what I think distinguishes art from craft. I am a true fan of Carlson’s bizarro world. This tape has become my gateway to enter the deep waters of creative meditation, in search of the big, deep fish (deep-diving David Lynch fans will know what I’m talking about). For those of you that are ready and waiting for more, keep your eyes peeled on the DRAFT website. We’ll be issuing our first LP for Matt in the coming months, and let me tell you: this one ups it a notch on the weirdo-scale! And for those of you in Seattle this Friday, May 13th, come check out Matt’s solo modular set at the Chapel Performance Space in Wallingford. Gift Tapes presents a special night of outsider electronic music, featuring Matt Carlson and RM Francis. Portland-based Matt Carlson (Golden Retriever, formerly of Parenthetical Girls) will perform a set of modular synthesizer music. 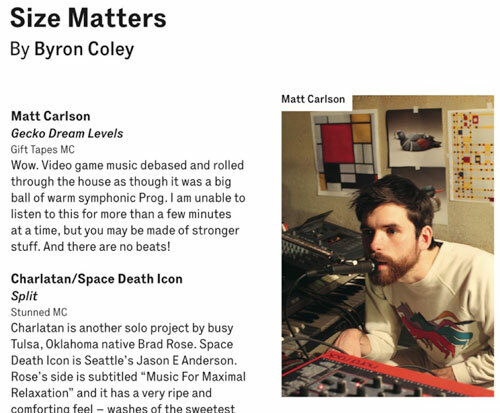 Carlson’s very unique and warped, cartoon-like sensibility places classic analog synthesis amidst far-out video game soundworlds. 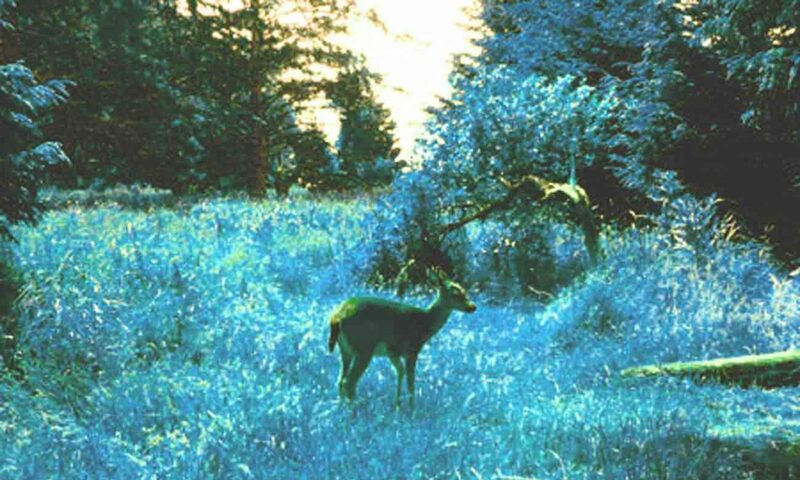 His recent release for Gift Tapes, Gecko Dream Levels, has managed to turn the heads of quite a few contemporaries (see this writeup by Keith Fullerton Whitman). Opening the performance, Seattle-based RM Francis will perform new electronic works and real-time compositions for computer. Through live manipulation and time-stretching, Francis exposes the hidden artifacts of digitally generated sound, while crafting immersive environments of beauty and unpredictability. We are extremely happy to present his solo debut, having become acquainted with his work earlier in the year at prior GT events. 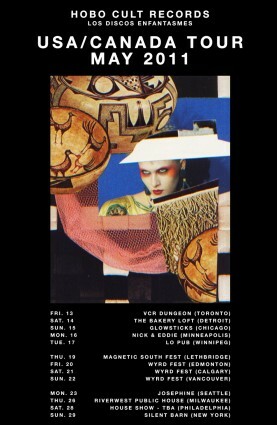 Join us for a fresh perspective on contemporary underground electronic music. Garrincha & the Stolen Elk in Seattle! Later that night, Sam of Debacle Records is hosting a show at the Josephine in Ballard. It’s a super fresh lineup put together for the duo Garinncha & the Stolen Elk. I’ve heard the recent tape they put out on Stunned Records and it’s a totally insane mix of influences, ranging from punk to free jazz to synth music, which can only lead to good things in live performance! 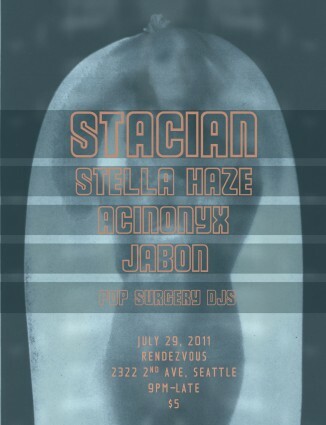 Also performing that night is Derek Monypeny and Seattle locals: Megabats, Panabrite, Summon Thrull & Harpoon Pole Vault. 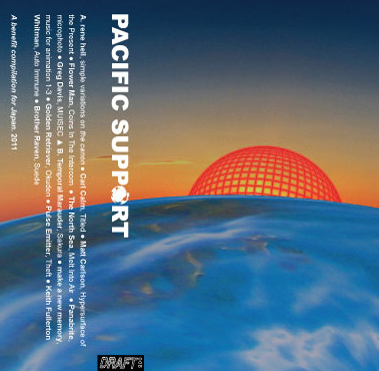 Gift Tapes sub-label DRAFT is pleased to announce the release of Pacific Support, a benefit compilation created in support of the ongoing disaster relief efforts in Japan. All proceeds will be donated to the Red Cross to help fund those efforts. The compilation consists of 13 unreleased tracks by experimental electronic musicians featuring: Rene Hell, Pulse Emitter, Keith Fullerton Whitman, Greg Davis, Matt Carlson, The North Sea, solo tracks by both members of the Caboladies: Carl Calm & Flowerman, Panabrite, Temporal Marauder, Golden Retriever, Brother Raven, and a duo project by Geoff Mullen & Sakiko Mori called Make a New Memory. Support Japan and purchase some amazing music. Available at the DRAFT website and coming soon to Mimaroglu Music Sales and Discriminate Music. Special thanks to the artists involved for donating their work, our distributors for donating their services, and National Audio Company for generously donating the entire 300-edition run. 300 edition, 75 minute tape w/ color insert. Check out the East Village Radio post. At Lo-Fi Performance Gallery 429 Eastlake. Hope to see the locals! New GIFT TAPES coming to you March 8th! We just posted them and are available now for preorder. I’d recommend getting in on this action early because I expect them to go quickly. This is Gift Tapes first special art edition batch – with art by Brenna Murphy. She’s also crafted some amazing preview videos – check them out! Tapes are $7 USA/$8 Can-Mex/$10 World. Pre-orders will be shipped on March 8th. Thanks for your support!